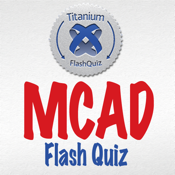 FlashQuiz MCAD, Titanium Certified App Developer is a new and rare certification. The Bafmin FlashQuiz app will help you study for the test by walking you through flash cards in the form of multiple choice flash cards. With immediate feedback and scoring of your practice you will be prepared to pass the certification test on your first attempt.